Russo-Turkish wars [Російсько-Турецькі війни; Rosiisko-Turetski viiny]. For two centuries the imperialist powers of Russia and Ottoman Turkey fought for hegemony of the Black Sea and its coastal regions. Initially Russia's goal was to gain control of the Black Sea and its straits and thereby ensure access to the Mediterranean Sea. Russia's expansionism was disguised by its self-appointed defense of all Orthodox Christians subjugated by Turkey, liberation of the Balkan peoples from the Turkish yoke, and prevention of Turkish and Crimean Tatar raids and pillaging in Southern Ukraine and Russia. Turkey sought to protect and retain its possessions and considered Russia the aggressor. From the second half of the 18th century the Russo-Turkish wars were linked to the gradual disintegration of the Ottoman Empire. According to the obligations enumerated in various 17th- and 18th-century treaties with Russia the Hetman state and Ukraine's inhabitants were duty-bound to participate in Russia's wars. Thousands of Ukrainian Cossacks and peasants fought and died as allies and later citizens of the Russian Empire. In the later wars many of them volunteered to help liberate their fellow Slavs and coreligionists. All of the wars involved Ukrainian strategic interests, and during each one Russian armies passed through Ukraine, inflicting various degrees of ruin and hardship. The war of 1676–81. In 1677 a Turkish–Crimean Tatar army invaded and ravaged Right-Bank Ukraine and took the capital, Chyhyryn. The Turks' attempt to retain Chyhyryn was repelled by a Russian-Ukrainian force led by Prince G. Romodanovsky and Hetman Ivan Samoilovych (see Chyhyryn campaigns, 1677–8), and the Turks were forced to retreat. In 1681 the Ottoman Porte, the Crimean Khanate, and Muscovy signed the Treaty of Bakhchesarai, according to which Muscovy had sovereignty over the Hetman state and the Zaporizhia, both sides agreed not to colonize the Southern Ukrainian lands between the Boh River and the Dnister River for 20 years, and Turkey retained control of the southern Kyiv region, the Bratslav region, and Podilia. The war of 1686–99. As a member of the Holy League against Turkey, Russia began the war with unsuccessful Russian-Ukrainian Cossack campaigns against the Crimean Khanate in 1687 and 1689. Hetman Ivan Samoilovych was blamed for the failure of the first campaign and was replaced by Ivan Mazepa. Later Peter I undertook the Azov campaigns of 1695–6, in which he captured Oziv (Azov) in 1696. By the 1699 Treaty of Karlowitz Russia consolidated its hold over the Sea of Azov and its littoral. The war of 1710–13. During Russia's Great Northern War with Sweden the Porte, encouraged by Swedish, French, and Austrian diplomats, declared war on Russia. In early 1711 the Russian army of Peter I and Hetman Ivan Skoropadsky's Cossack regiments from Left-Bank Ukraine defeated the Crimean Tatar army and its Cossack allies, led by Pylyp Orlyk, and forced them to abandon Right-Bank Ukraine. The Russian offensive in Moldavia was defeated at the Prut River, however, and the Prut Treaty of 1711 forced Russia to abandon Oziv and to destroy its fortifications on the Sea of Azov coast. 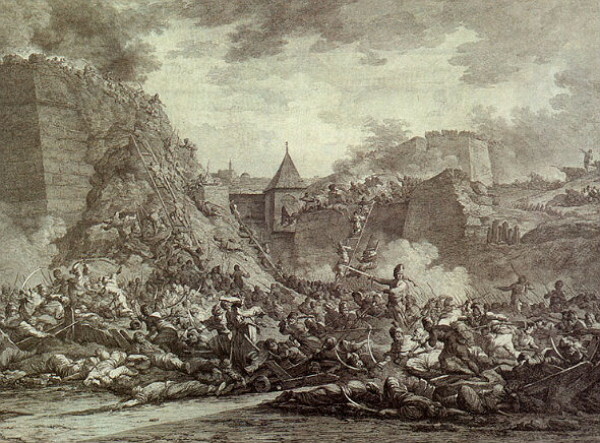 The war of 1735–9. After the Crimean Tatars invaded Ukraine in 1735, the Russian Dnieper Army (which included Ukrainian Cossack regiments) invaded the Crimea, where they captured Perekop, Yevpatoriia, and Bakhchesarai in 1736 and Ochakiv in 1737. Another Russian army recaptured Oziv and invaded the Crimea from the east. In 1739, while Turkey was occupied with its war with Austria, the Russian army captured Khotyn. The 1739 Russo-Turkish Treaty of Belgrade granted Oziv to Russia and consolidated Russia's control over the Zaporizhia but forbade Russian fleets on the Sea of Azov and Black Sea. The war of 1768–74. The theater of the war was in Moldavia and Wallachia, where Russian troops and Zaporozhian Cossacks under the supreme command of Gen Petr Rumiantsev were victorious in various battles. The Russian fleet destroyed the Turkish navy in the Aegean Sea. Under the 1774 Peace Treaty of Küçük Kaynarca Russia gained the right to have a fleet on the Black Sea and coastal fortresses in Southern Ukraine. Weakened by the war, Turkey was forced to cede Bukovyna to Austria in 1774. Having finally gained access to the Black Sea, Catherine II no longer considered the Zaporozhian Sich necessary for the defense of the empire and in 1775 had it destroyed. The war of 1787–91. The new conflict erupted as a result of Turkish efforts to regain the Crimea, which had been annexed by Russia in 1783. Under the command of A. Suvorov, Russian forces defeated the Turks at Kinburn (1787) and Focşani, in Moldavia (1789), and took Ochakiv and Izmail (1790). The 1791 Treaty of Iaşi confirmed Russia's annexation of the Crimea and granted Russia control of the lands between the Boh River and the Dnister River. The war of 1806–12. After Turkey tried to regain the Black Sea's northern littoral, Russia again invaded and occupied Moldavia and Wallachia and routed the Turks near Rushchuk, on the Danube River. Under the Bucharest Peace Treaty of 1812 Turkey ceded Bessarabia, that is, the territories between the Dnister River and the Prut River, to Russia and guaranteed Russian access to shipping on the Danube River. The war of 1828–9. Hostilities began after Russia came out in support of the Greek revolution and sent troops to the Balkans and the Caucasus Mountains. In the early phase of the war a small force of Cossacks of the Danubian Sich led by Otaman Yosyp Hladky went over to the Russian side. By the 1829 Treaty of Edirne Turkey accepted Russia's annexation of the islands at the mouth of the Danube River and the Caucasian coast, including the fortress of Anapa, recognized Russia's title to Georgia and other Caucasian principalities, and guaranteed Russia access to the Danube River and the Black Sea straits. The war of 1853–6. See Crimean War. The war of 1877–8. In 1877 Russia declared war on Turkey in support of the Balkan rebellions. Many Ukrainian volunteers had already joined the Herzegovinian and Bulgarian uprisings and the Serbian army. Several (eg, Teofan Vasylevsky, Andrii Lysenko, V. Yanovsky) wrote memoirs about their experiences. Thousands of Ukrainians fought in Russian units during the Balkan campaign, and committees that gathered funds and medical aid for Serbian and Bulgarian soldiers were formed in Ukraine. In 1878 the Russo-Turkish Treaty of San Stefano created a ‘Great Bulgaria’ as Russia's satellite. At the Congress of Berlin, however, Austria-Hungary and Great Britain did not accept the treaty, imposed their own partition of the Balkans, and forced Russia to retreat from the Balkans.